One lucky registrant will receive a copy of Social Media for Lawyers. All registrants will have the ability to purchase the book at a discount rate. Please contact Carolyn Elefant at carolyn.elefant@gmail.com or Nicole Black at nicole@nicoleblackesq.com with additional questions. BONUS: In addition to these more general topics, we’ll show how to put them into practice with a step-by-step strategy on using social media to identify and secure speaking engagements in front of your target marketing audience and media coverage. 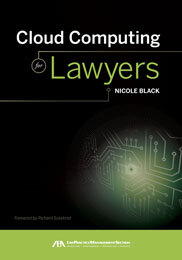 The webinar will be taught by Carolyn Elefant and Nicole Black, co-authors of the ABA bestseller, Social Media for Lawyers: the Next Frontier. Carolyn and Nicole are lawyers who have used the power of social media to benefit their respective careers. They offer trainings to law firms, bar associations and law schools on using social media to achieve professional goals. You can register for the webinar here and learn more about it here.